HTC appears to be jumping on the Android Wear bandwagon as a concept render of its 'One Wear' smartwatch surfaces online. HTC is entering the world of wearables with its so-called 'One Wear' smartwatch, which has showed its face in a leaked concept render. The smartwatch appears to retain many of the metallic features of the successful HTC One M8 that was released earlier this year. It has a metal strap and square front, rather than the rounded face that was rumoured like the one on the Moto 360. Sources claim that concept render is based on a model already in the works at HTC. 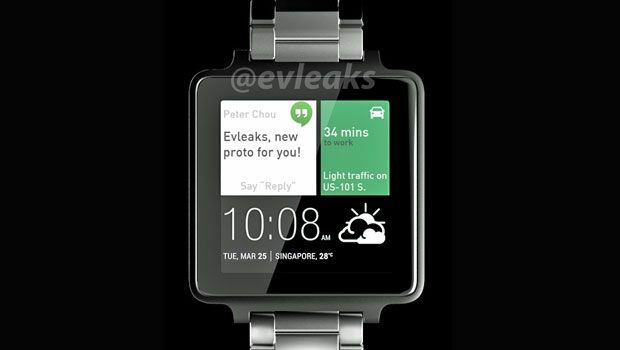 The pictures show a split-screen user interface with three panes showing the date and time, weather, traffic and a Hangouts notification – all run on a HTC sense-themed version of Google's Android Wear OS. So far that's about it, with no word yet on what features it will boast or when it's set to arrive. The first Android Wear-powered devices launched earlier this month, with both the LG G Watch and Samsung Gear Live now available to purchase in the UK.